Home > Biometrics, Coming Events	> Will iris scans be the way our children see their future? Will iris scans be the way our children see their future? Six-year-old Susie is excited about her first day of school. She lets go of her mom’s hand, looks back and waves at her as she climbs the steps of the big yellow school bus. When she reaches the top step, she presses her face against a machine that looks like binoculars — an iris scanner — which confirms that she has boarded the bus, and then she takes a seat next to her best friend. Fast-forward 12 years, and little Susie is all grown up and ready to buy her first car — but there is a problem. The car salesman explains to Susie that there is an issue with her credit, and they won’t be able to finance the car she worked for throughout high school. As it turns out, Susie’s identity was stolen by a hacker years before she was even old enough to know what credit was. Using her biometric information collected by her school, the hacker obtained loans and credit cards all during her school years. Is this a far-fetched scenario? Not really. Biometric information is any physical or behavioral information that is specific to a single person, such as a fingerprint, palm print, DNA, facial recognition, retina or iris, and voice print. These characteristics can be scanned, stored and used to confirm a person’s identity — and who knows what else. While Susie can change her PIN number for her credit card to ward off unauthorized usage, the iris does not change over a person’s lifetime. What type of information is being collected? Who has access to this information? Where is the information being stored, and is it secure? Can this information be gathered into larger data pools for a national database? Can corporations buy this information for their own commercial use? 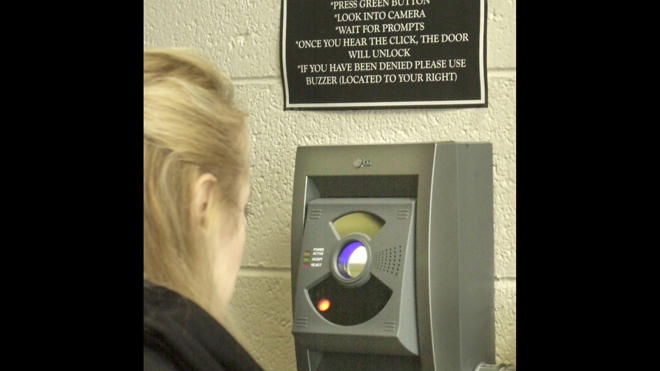 What happens when a student’s biometric information is stolen? Are there health concerns? Have parents given their permission? Should we be concerned? The simple answer is YES. Some schools in Florida (thankfully not in my district of Volusia, Marion and Lake counties) have started collecting biometric information for various school applications — to speed up lunch lines, check out a library book, record attendance, track students’ movements on campus and for boarding the school bus. Will testing, evaluation and health care information be added to the mix? The Polk County school district has already collected iris scans of approximately 750 schoolchildren without parental consent, so they could board the school bus. The Pinellas County school district has collected 50,000 palm scans so school children could pass through the lunch line. Is this only a Florida problem? No. Texas, California and New York have tried “smart” ID cards, which use radio frequency identification (RFID) chips to track a student’s location on campus at all times. Maryland used palm scanners to access students accounts in cafeteria lines. Is this only a U.S. problem? No, countries throughout the world are busy collecting biometric information — Australia, Canada, Mexico, the Netherlands, the United Kingdom and on and on. India currently has the largest biometric information program in the world with more than 200 million enrolled, which is expected to increase to 1.25 billion people. In light of today’s expanding and changing uses of technology and the real threat of identity theft, I am concerned we are moving forward without questioning the consequences to our privacy, civil rights and our economic freedom. The Florida Constitution, Article I, Section 23, expressly provides that “every natural person has the right to be let alone and free from governmental intrusion into the person’s private life” and is justification for preventing intrusion by government into our lives and for preventing disclosure of personal information. However, if this information is taken without permission, stolen or compromised, how do you change or reset it? Mind Reading Machine For Sale In Europe Now What does the future hold for the company whose visionary plans include implanting a chip in our brains?